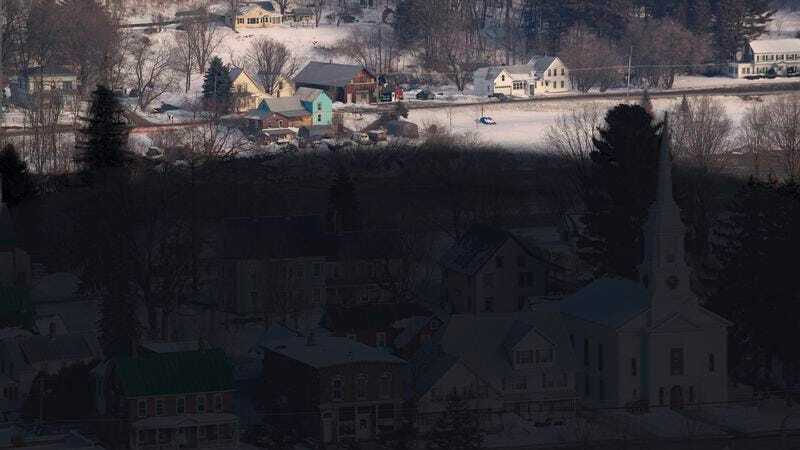 JACKSON, NH—Drawing tens of thousands of residents out of their homes and businesses to stare upward into the sky, Hillary Clinton’s colossal, floating campaign headquarters reportedly moved into position over New Hampshire this morning, casting the entire state into darkness. “I was just driving down Route 302 when I heard this deep, pulsing drone and saw a dark line of shadow moving down the mountainside toward me—I nearly drove off the road,” said local resident Patrick Schoenberg, who, like hundreds of other motorists, pulled off to the side of the highway and looked up at the 9,500-square-mile Hillary for America campaign vessel as it slowly crawled across the horizon and blotted out all daylight. “It finally came to a stop an hour or so ago. But its engines just keep whirring constantly, rattling the house. My kids won’t stop crying.” At press time, the state’s 1.3 million residents were reportedly cowering in their basements after the gigantic red H on the vessel’s underside lit up and 300 enormous mechanical arms began slowly descending into each of the state’s voting precincts.